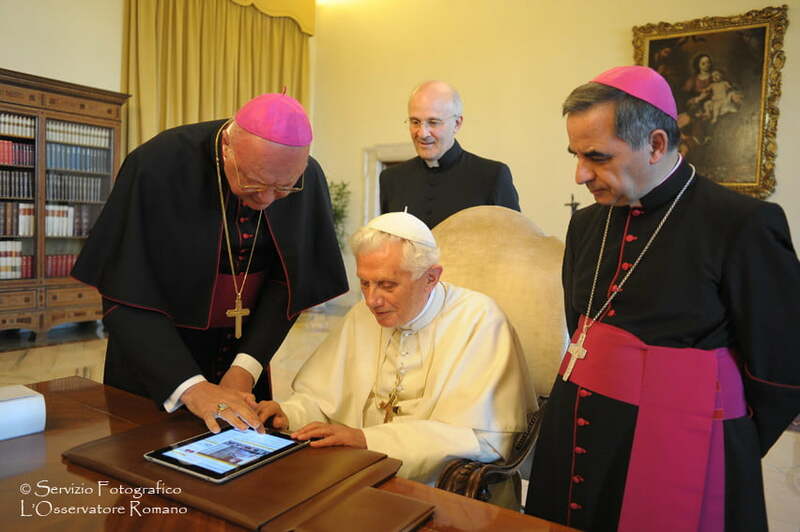 The Roman Catholic Church further solidified its place in the 21st Century today after Pope Benedict XVI sent out his first holy tweet via an Apple iPad to announce the launch of the Vatican’s fresh new website, News.va. As a bonus, the 84-year-old pontiff gave his blessings to the digital realm. “Dear Friends, I just launched www.news.va. Praised be our Lord Jesus Christ! With my prayers and blessings, Benedictus XVI,” tweeted the Pope. In addition to a Twitter feed, which has amassed nearly 40,000 followers, the Vatican also has its own YouTube channel, Facebook page, and Flickr photo feed. The Church’s new website, and the rest of its Internet-based endeavors, is the work of the Vatican’s Pontifical Council for Social Communication. The Council is guided by the principal that the Church sees “the media as an outcome of the historical scientific process by which humankind ‘advances further and further in the discovery of the resources and values contained in the whole of creation,'” according to the Council’s declaration, “The Church and Internet.” In other words, social media is simply part of God’s grand scheme. News.va will serve as the central media hub for the Church and the Vatican. Decorated in the white and yellow colors of the Vatican, the website brings together the Vatican’s radio, television and print outlets, most recent tweets, plus news about its missionary work in the developing world. The Church’s embrace of social media is also part of its efforts to distance itself from, and combat against, the scandals that were able to gestate in its traditional atmosphere. “The pedophilia scandals of recent years have shocked the Church and have encouraged it to abandon the language of tradition,” says Bruno Bartoloni, a journalist and Vatican expert, who spoke with AFP. The Vatican “does not want to stay on the sidelines of the web,” he added. The Roman Catholic Church was founded in the year 380 AD by Roman emperor Constantine, though many Catholics believe the Church was actually established by Jesus Christ.